Fonds documents the North Bay Teachers' College branch's involvement in a Junior Red Cross program in which branches around the world created and exchanged portfolios (scrapbooks) in order to foster international understanding. Each scrapbook contains information about the branch that created it, its home country, city, and institution. The scrapbooks include photographs, drawings, paintings, handicraft samples, newspaper clippings, essays, and descriptions. 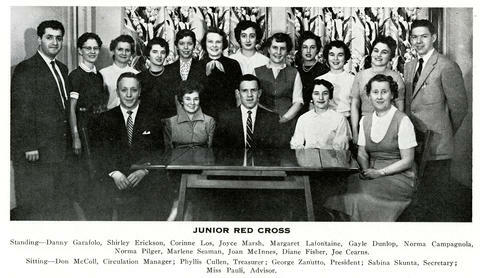 The image linked to this description (junior_red_cross_1955-1956.jpg) is a group portrait of the members of the Junior Red Cross of North Bay Teachers' College from the North Bay Teachers' College 1955-1956 yearbook, page 37.